2. Electrical braking doesn't involve high maintenance cost unlike mechanical braking. In mechanical braking we need to replace break shoes periodically which involves high maintenance cost. 3. Amount of heat generated in electrical braking is very much less than that of heat produced due to mechanical braking. This heat produced in mechanical braking at brake shoes leads to failure of brakes. 4. In electrical braking a part of electrical energy is returned to supply which helps in reducing the running cost. 5. Using electric braking the capacity of the system like higher speeds, heavy loads can be increased which cannot be obtained through mechanical braking. Because of the above advantages we use electrical braking to stop dc motor instead of using mechanical braking. Now let us see about electrical braking in detail. 2.Dynamic Braking or rheostatic braking. Here let us see how electrical braking is applied to stop dc shunt motor and dc series motor. Each of the three electrical braking methods to stop dc shunt motor are discussed clearly below. In this type of braking if the load on the dc shunt motor increases the speed of motor above the no load speed at constant excitation then the back emf (Eb)produced will be greater than the supply voltage at this stage dc shunt motor acts as generator since the motor armature current reverses its direction. So now it supplies power to the line. Due to reversal of direction of armature current as Eb > V, armature torque is reversed and speed falls until Eb becomes less than V so the motor doesn't completely stop in regenerative braking only speeds above no load speeds are decreased and controlled. Regenerative braking is clearly shown in the following figure. 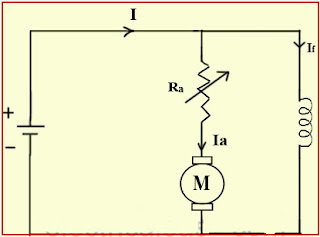 In dynamic braking we disconnect the armature of dc motor from the supply and connect a resistor to it while the field is connected to the supply as shown in the following figure. As the armature is disconnected from the supply and connected as shown above now it acts as generator and kinetic energy stored in rotating parts and connected load is converted into electrical energy and is dissipated through rheostat as heat energy and dc shunt motor stops. This is not an efficient method because all the generated energy is dissipated as heat energy. 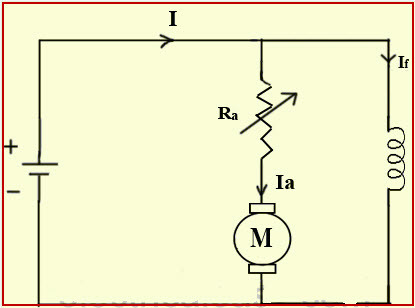 In this method the terminals of the armature of dc motor or supply polarity is reversed. So the torque direction gets reversed and hence back emf Eb and supply voltage V will be in the same direction. So now voltage will 2V which involves high inrush current to prevent this we add a resistance as shown in the following figure. Now the motor speed decreases slowly and stops, at this point an external device is required to cut off supply as soon as motor comes to rest.Plugging gives greater braking torque as compared to rheostatic braking or dynamic braking. Each of the three electrical braking methods to stop dc series motor are discussed clearly below. 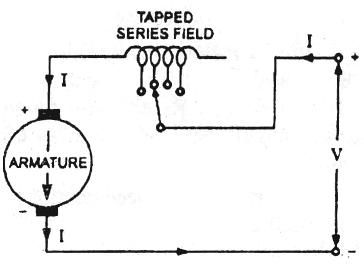 In this the armature is disconnected from the supply and current through the armature reverses its direction and field remains connected to the supply. Care should be taken such that current direction through field doesn't changes for this purpose we reverse the field .Now dc series motor acts as dc series generator. This can be shown in the following figure. Now the kinetic energy stored in rotating parts and connected load is converted to electrical energy and dissipated through rheostat as heat and dc series motor stops. In this method terminals of the armature or supply voltage are reversed and a resistance is added to control magnitude of braking torque. By this dc series motor stops. The figure is shown in the following diagram.Plugging gives greater braking torque as compared to rheostatic braking or dynamic braking. Regenerative braking with dc series motor is not possible because increasing in excitation causes decrease in speed. Back e.m.f Eb cannot be greater than supply voltage.So regenerative braking is not possible with dc series motor to make it possible we need to connect dc series as shunt motor. For traction motors regenerative braking is done by special arrangement as shown in the following figure. Using series motors for regenerative braking the fields must be excited separately and use stabilizing circuits. The figure shown below gives connections for regenerative braking on dc series motor. By connecting in this way back e.m.f Eb can be made greater than V and can be run as generator and torque gets reversed and speed falls till Eb becomes less than V. Hence in this way regenerative braking is done on dc series motor. In this post we have discussed about electrical braking of dc series and dc shunt motor. To download this post on electrical braking of dc motors as PDF click here. DC motors brought us revolutionary changes in industrial and domestic applications.This all because of an unique feature of DC motors i.e, speed controlling of DC motors .Compared to Synchronous motor , Induction Motor controlling the speed of DC series or DC shunt motor is very easy and efficient. 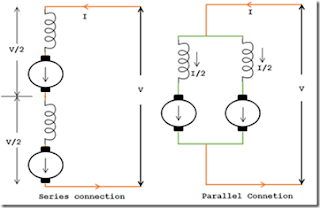 Now let's get into the detailed explanation on how we can control speed of DC motor ? Speed controlling is nothing but changing our DC motor speed according to our requirements.We have different methods to control speed.DC motors are majorly categorized into DC series motors and DC shunt motors. We have separate methods of speed control for dc series motors and dc shunt motors. In DC motor an EMF induced in armature conductors due to the rotation of armature in magnetic field this is called back EMF (Eb). The magnitude of the Eb can be given by the EMF equation of a DC generator. This shows the speed of a dc motor is directly proportional to the back emf and inversely proportional to the flux per pole. As said above we have separate speed control methods for both dc shunt motors and dc series motors. Let see each of them in detail. There are three methods by which speed control of dc shunt motor is done. As we said speed of dc motor is inversely proportional to flux per pole. So by decreasing the flux per pole the speed of the dc shunt motor can be increased. 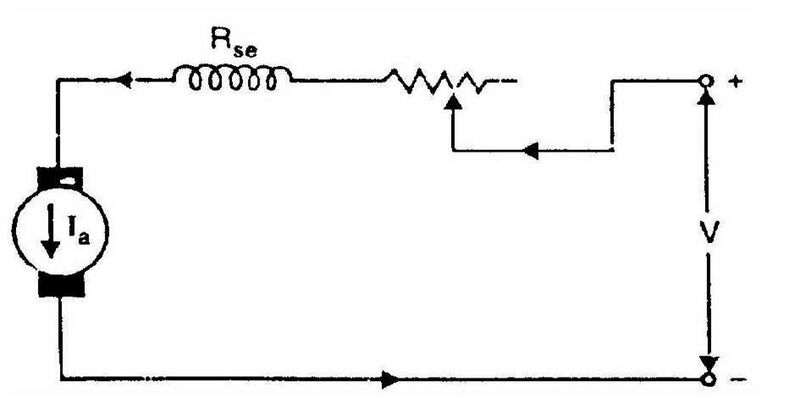 To decrease the flux per pole we need to add a rheostat in series with the shunt field winding as shown in the following circuit. By increasing the resistance current If decreases so flux decreases. As flux decreases speed of dc shunt motor increases as speed is inversely proportional to flux. This method is efficient because If2Rf value is small because If is small. It has limitation though it can gain maximum speed. Limitation arises because weakening of flux beyond the limit will adversely affect the commutation. As discussed speed of a dc motor is directly proportional to back e.m.f Eb where Eb = V - IaRa. By keeping V and Ra constant back e.m.f Eb depends on Ia.Add a resistance in series to the dc shunt motor armature as shown in the following circut. Now by increasing the resistance current decreases.As current decreases back e.m.f Eb decreases. As back e.mf Eb decreases speed of the dc shunt motor decreases. In this method the armature is supplied with variable voltage with the help of a suitable switch gear.The voltage across the shunt field is maintained constant. As the speed of dc shunt motor is directly proportional to voltage across the armature the speed of dc shunt motor can be controlled accordingly. To understand speed control of dc shunt motor by this method see the circuit diagram given below. Here motor M1 drives the generator G. Motor M1 has constant speed. M2 is the motor whose speed is required to be controlled.Generator G is coupled to M2.Here the voltage from the generator G is supplied to armature of motor M2. The voltage supplied by the generator can be varied smoothly with the help of field regulator . So by Ward - leonard system smooth speed control of dc shunt motor is obtained. There are three methods for controlling speed of dc series motor. 2. Armature - resistance control. 3. Series - parallel control. Let us discuss speed control of dc series motors by different flux control methods. 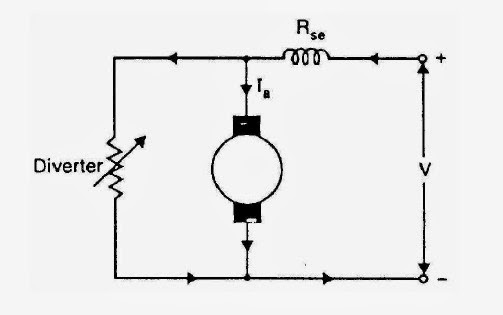 Here we connect a variable resistance in parallel with the series field of dc series motor as shown in the following circuit. 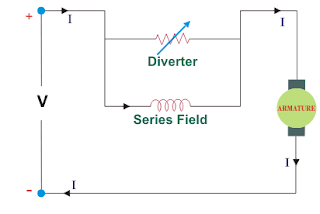 As we have connected a variable resistance in parallel with the series field some of the current that has to flow through series field is diverted to variable resistance( this is the reason why it is called divertor). So the current flowing through the series field decreases as current decreases flux decreases. We know speed of dc motor is inversely proportional to flux as flux decreases speed of dc series motor increases so we can achieve high speeds with this method of speed control of dc motor. 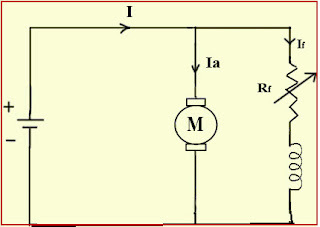 In this method we connect a variable resistance parallel to armature of dc series motor as shown in the following circuit. As we have connected variable resistance in parallel to armature the armature current Ia decreases.We know torque equation for a dc series motor is Ta ∝ ØIa. So for a constant load torque if Ia decreases flux Ø increases to maintain load torque constant. So the dc series motor draws more current from the supply so flux Ø increases as flux increases speed decreases as speed of dc motor is inversely proportional to flux. In this way the speed of dc series motor can be achieved by this method. Here the series field winding has tapping as shown in the following circuit. By selecting the suitable tap the number of turns connected in the circuit can be changed. We know speed of dc motor is inversely proportional to flux by changing the number of turns of series field connected in circuit the flux can be changed. If more number of are turns are connected to the circuit then current decreases so flux decreases. As flux decreases speed increases. If number of turns connected in the circuit are less current will be high. As current is high flux will be high so speed of dc series motor will be less. So according to the required speed we can choose the required number of turns and control speed of dc series motor. Here the series field coils are regrouped and are connected in parallel as shown in the following circuit diagram. As the series field winding is regrouped and connected in parallel the flux will decrease since current decreases.As speed of dc motor is inversely proportional to flux the speed of dc series motor will be high. According to the required speed i.e, high or less the coils are regrouped. In this method we connect a variable resistance in series with the series field winding as shown in the following circuit. 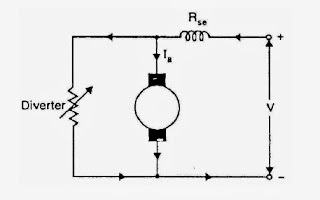 By adding the resistance in series with the series field the voltage across the armature is reduced. As the speed of dc series motor is directly proportional to voltage across the armature the speed of dc series motor is reduced accordingly. This is the most common method for speed control of dc series motor. This method is generally applicable for electrical traction. For two or more dc series motors which are coupled this method is possible. 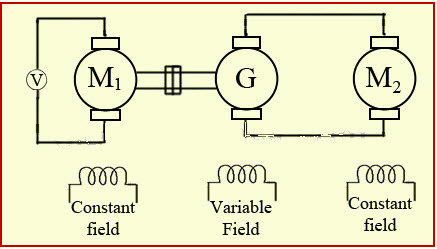 In this method to gain less speeds the two series motors are connected in series. In series current is high(as current division is not there) we get high current as current is high flux is high. As speed of dc motor is inversely proportional to flux we get low speed. When the two dc series motors are connected in parallel the current is less( since current s divided between two series motors)as current is less flux is less so high speed is obtained. So according to the required speed we connect the dc series motors either in series or parallel. The circuit diagram for speed control of dc series motor by this method is shown below. In this way speed control of dc series motor and dc shunt motor can be done.